Don't write off the housing industry -- it still has room to run, and Masonite International, Beacon Roofing Supply, and Owens Corning can give your portfolio excellent exposure to it. 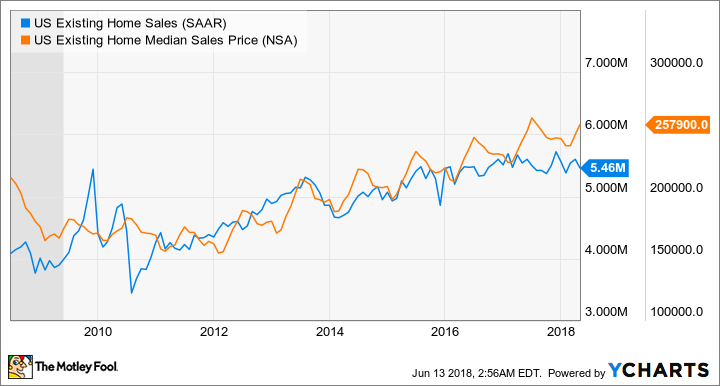 It hasn't been a good year on Wall Street for the homebuilding products sector, but I think the stocks' declines have started to make some of them look like good values. Door manufacturer Masonite International, roofing materials distributor Beacon Roofing Supply, and roofing and insulation materials company Owens Corning are cheap by many valuation metrics, and according to analysts' estimates, all have strong growth prospects. Let's take a look at why each has been sold off, and what investors need to know before deciding whether or not to buy in. Falling unemployment and new home generation will support the housing market. Image source: Getty Images. Analysts' average estimates are for double-digit percentage earnings-per-share growth over the next couple of years, and based on the current prices of the stocks, their forward P/E ratios look very attractive. Data sources: Company presentations, analysts' average estimates, author's analysis. Moreover, they are all cheap on a price-to-free-cash-flow basis as well. In a nutshell, all three have faced a combination of factors that have caused some near-term headwinds. First, rising raw material costs have pressured margins. Second, harsh winter conditions caused general slowdown in construction activity (Owens Corning and Masonite), and in particular, a slowdown in roofing activity (Beacon Roofing and Owens Corning). Those effects certainly impacted their winter quarters. For example, in the Beacon Roofing's earnings release, CEO Paul Isabella said: "Second quarter results fell short of our expectations, as harsh winter weather conditions limited customers available work days." Owens Corning CEO Mike Thaman mentioned the "greater than expected inflation that we have experienced" in his company's Q1 press release. Meanwhile, Masonite lost 84 production shifts (U.K. and U.S.) during the winter quarter as a result of poor weather, and management noted significant price increases in raw materials such as steel (up 20% in the first few months of 2018), oil (up 12%), as well as higher freight distribution costs. So, yes those transitory headwinds do matter -- if you're concerned about a thin slice of the earnings picture. However, there's little these companies can do about inclement weather and it's not a good idea to base long-term investment decisions based on a single poor winter. As to the idea that rising raw-materials costs will drag on these companies, there are two counter-arguments. First, their end markets are good, which has allowed (and will continue to allow) all three to raise prices to offset rising costs. And second, historically speaking, raw material costs tend to experience a sharp recoveries in year-on-year growth, followed by periods of more moderate growth. 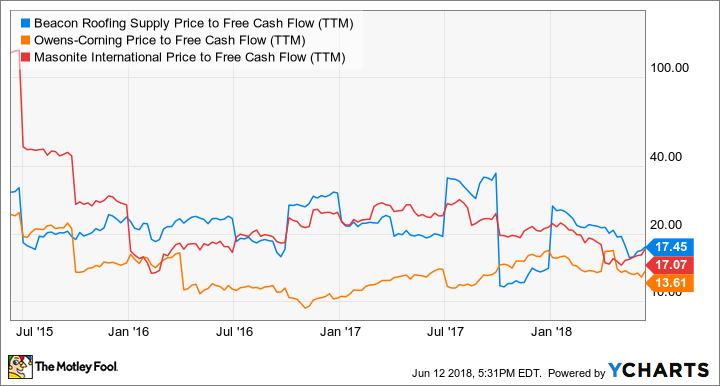 In fact, Beacon Roofing's "Second quarter pricing improved more than 200 basis points versus last year, representing a 2nd consecutive quarterly gain and our highest increase in more than five years." Meanwhile, Owens Corning's management was able "to achieve sufficient pricing in the year to overcome the impact of asphalt and transportation cost inflation," while Masonite used a combination of price increases and productivity gains to offset higher raw material costs, resulting in gross profit margin expansion in the first quarter (20.4% compared to 19.6% in the same period last year). It's easy to think of doors and roofing as plays on new housing construction, but actually, their biggest end demand driver is repair and remodeling activity. Beacon estimates that 75% to 80% of its exteriors business is derived from repair and remodeling; so did 80% of Owens Corning's 2017 roofing demand. And repair and remodeling is Masonite's single biggest revenue generator. The bullish argument here is that even if housing sales growth slow, if house prices continue to increase, homeowners will be likely to keep investing in their appreciating assets -- and that's exactly what appears to be happening. Furthermore, two leading remodeling indicators suggest good times ahead. One -- the National Association of Home Builders (NAHB) remodeling market index -- is a survey of its members. A reading above 50 indicates rising activity relative to the previous quarter. The other is the Leading Indicator of Remodeling Activity (LIRA), published by the Joint Center for Housing Studies of Harvard University. and as you can see below, its forecast is for growth of more than 7% for the next four quarters. Data source: NAHB. Joint Center for Housing Studies of Harvard University. Chart by author. If you think the housing market is heading for a slump caused by rising interest rates, then avoid these stocks. And, if you're worried about the possibility of near-term downward earnings revisions, then you should also avoid these stocks. Frankly speaking, between the rising costs of their raw materials and the poor winter quarter they just experienced, Beacon and Owens Corning in particular will have a job to do to meet expectations in the coming quarters. No matter. Underlying market conditions remain positive, and there's enough margin of safety in the stocks' valuations to make them good values for long-term investors. More cautious investors may want to wait to buy until they see next quarter's earnings reports, as costs continued to rise through the last one.